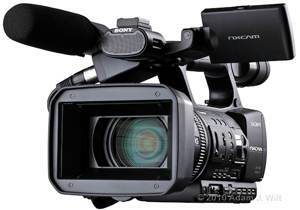 Attracting interest as Sony’s first AVCHD codec’d camcorder—it’s an upgraded variant of the already successful HDV-based HVR-Z5E, a camcorder that won best of show at IBC 2008—the Sony HXR-NX5U NXCAM turned up at the Sony/Band Pro open house this past week. The relaxed event (okay, not that many folks turned up, which I attribute to minimal outreach) gave me a chance to have a closer look. Also helping was the camera demo’r, none other than Sony’s Juan Martinez, who, I understand, had much input as to camcorder’s final design, which offers loads of practical, useful touches. That’s because Martinez, who came over from JVC and is now senior manager of acquisition systems at Sony, not only has plenty of ideas of his own as to what makes a good camcorder, but ferries requests and info between Sony’s engineers in Japan and the many DPs, directors, and others that he listens to here. There are plenty of good ideas here. Simple ones count, such as the ability to change peaking colors for focusing: a red, white, or blue edge around the subject in the viewfinder, for example, makes it much faster and easier to focus, as a thin edge pops in and out of resolution, while the different colors allow choice of a color that best stands out with the subject’s color. The basic images the camcorder turns out look improved over comparable HDV offerings anyway, as it’s using the high quality Z5 lens and front end along with the more up-to-date AVCHD codec. No matter how good the Carl Zeiss zoom lens used in the earlier comparable Sony camcorders might be in the abstract, by developing its G Series zoom in-house Sony has been able to optimize the optics and mechanics of the lens for the sensors. The wide angle of view available with the bottom of the zoom–29.5mm—is great for filming in-doors and other tight spots. Another useful new feature, SteadyShot Active Mode, uses the built-in accelerometer and other technology to reduce the impact of camera shake and movement. If you can hold the camcorder and walk without too much movement, this allows you to turn out a convincing tracking shot without relying on a bulky, expensive stabilization rig. 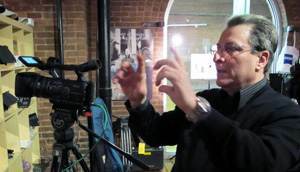 DV User editor Nigel Cooper, who had early access to a prototype NXCAM, offers his take here. If you don’t care to read, here’s a short video of Cooper’s overview. Find Adam Wilt’s first review, which I mentioned earlier, as posted on the ProVideo Coalition website here. D.W. Leitner’s first take on the millimeter site is here. Here’s a little back and forth on DVInfo.net discussing the merits of the Z5 versus Nexcam. Nothing especially enlightening here as yet, but Creative Cow usually runs good forum pages, so wait until this heats up. Not exactly sure why this would be useful or interesting before the camera has shipped (too little footage available), or after it’s hit the market en masse (too much footage), but here’s a Vimeo page devoted to footage from anyone shooting with the NXCAM.